Disney Beauty and Beast Badges Cotton Fabrics for quilting, sewing, craft, and home decor projects..
Disney Beauty and Beast Small Badges Cotton Fabrics for quilting, sewing, craft, and home decor proj..
Disney Beauty and Beast Stained Glass Cotton Fabrics for quilting, sewing, craft, and home decor pro..
Disney Beauty and the Beast Fabric Collection, Disney Beauty and the Beast Beast Stained Glass Pane..
Disney Beauty Belle Princess Heart Cotton Fabrics for quilting, sewing, craft, and home decor projec..
Disney Belle Brains and Beauty Blue Cotton Fabric for quilting, sewing, craft, and home decor projec..
Disney Cinderella at the Ball Cotton fabric features Cinderella tossed in scenes with other characte..
Disney Cinderella Character Toss fabric features Cinderella tossed with other characters on a blue c..
Disney Cinderella Princess Heart Cotton Fabric for quilting, sewing, craft, and home decor projects..
Disney Heart Strong Princess Cotton Panel. This panel has 4 smaller panels that are 21." 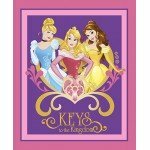 tall by 18"..
Disney Princesses Fabric Collection, Disney Heart Strong Princess Cotton Panel, Princesses included ..
Disney Princesses Fabric Collection, Disney Never Underestimate a Princess Cotton Panel, Princess in..
Disney Princesses Fabric Collection, Disney Princesses Dream Big Cotton Panel, Fabrics for quilting,..
Disney Princesses Keys to the Kingdom Cotton Panel for quilting, sewing, craft, and home decor proje..
Disney Princesses Patch Fleece This fabric is great for no-sew blankets, craft, and home decor proje..
Disney Rapunzel and Friends Cotton Panel, Fabric for quilting, sewing, craft, and home decor projec..
Disney Schooled in Cruel Cotton Fabrics for quilting, sewing, craft, and home decor projects..
Disney Sleeping Beauty Pink Toss fabric features Sleeping Beauty, Prince Phillip, Maleficent, Fauna ..
Disney Villian Friends Cotton Fabrics for quilting, sewing, craft, and home decor projects..
Disney Mulan Be Your Own Hero Cotton Fabrics for quilting, sewing, craft, and home decor projects..
Disney Mulan Let Dreams Blossom Cotton Fabrics for quilting, sewing, craft, and home decor projects..
Palace Pets Best Friends fabric features the pets of the Disney Princesses scattered on hills of gre..
Disney Princess All Over Sketch Light Blue Cotton fabric features sketches of Cinderella, Rapunzel, ..